General reporting tool (native JDE EnterpriseOne solution) that produces reports just based on a setup of a user, it is possible to define rows and columns and also specify overrides of any cell, many different types of formatting the data are supported (like rounding to thousands, formatting of dates etc), each row, column or even cell may have a different color which is used during export to MS Excel. Irrespective of the fact that each value of each report can be based on a different table or business view in EntepriseOne, the tool is extremely efficient and fast. Setup of the report is relatively easy, rows are defined by row definition and columns by column definition. Cell override may override logic of the column. 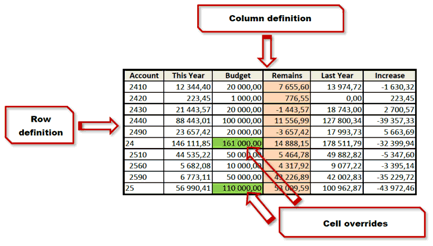 When the system starts calculating the cell, it merges setup of row with setup of a column or cell. So for example if the setup for row selects object account of 2410 and the setup of column performs calculation of this year actuals, the calculation for the first cell will be "calculate this year actuals for account 2410". The picture on the right presents a simple example of a report, green color was defined by cell overrides while the orange color comes from definition of a column. It is also possible to have a color for a row (for example for summary).